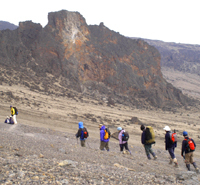 You will be privately transferred to Kilimanjaro or Arusha airports for your departure. But don’t go yet ! Consider our Taste of Tanzania itinerary. camps specified in the itinerary, on the basis of two persons sharing a twin-bedded room with en suite bathroom, or shower / toilets. All meals except for breakfast in Arusha throughout the scheduled safari. Activities, National park fees & taxes, all sightseeing excursions as specified. Most Equipment including oxygen for safety purposes – a full listing provided at deposit. Items of a personal nature, such as laundry, telephone calls, room service, alcoholic beverages, personal purchases, optional extra activities, etc. Any sightseeing or activities not specified in the itinerary. Age Limits – Minimum age requirements and any other age restrictions on request. Registration: A 25% deposit of the total land price, per person is required. The remainder of the cost is due 75 days prior to departure date. Airline tickets must be purchased within two weeks of reservation confirmation.